Assembling and detailed finishing touches take keen eyes and steady hands. 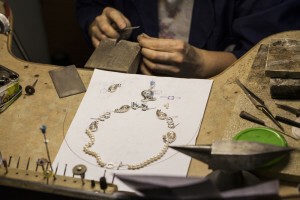 At Limpid Jewelry our jewelers and finishing experts are skilled in all aspects of the process, from cleaning of casting parts, assembling, lapping, polishing, electro plating and application of antique finish and many old or modern surface finishes. Careful attention to details ensures that every item that leaves our shop reflects the highest standards of quality. Old time’s skills, modern tools and techniques, attention to micro details, keen eyes and skilled hands is being reflected in your product final finishing.